Figure.moe (read as Figure Dot Moh-ay, More on “Moe” here) is where Kolezan foremost shows off his creative figure photography, the definitive place where you can see all his recent figure photos. Kolezan will also post figure reviews, anime goods collection updates and also music videos/covers created by him. He might write the occasional guide/how-to as well. Figure.moe will venture into Cosplay photography eventually. You may subscribe to Figure.moe via email updates (see the box “Subscribe via Email”), or if you use any of the following social media you can use those to get updates on new posts easily. You can also use any of these to contact Figure.moe/Kolezan or go to Contact me to send an email. DeviantArt: Kolezan: You can also buy my photos as full resolution downloads or as prints here! The first figure that I bought. At first figures didn’t appeal to me, but after some time I had to buy and try a figma because they are cheap and posable. 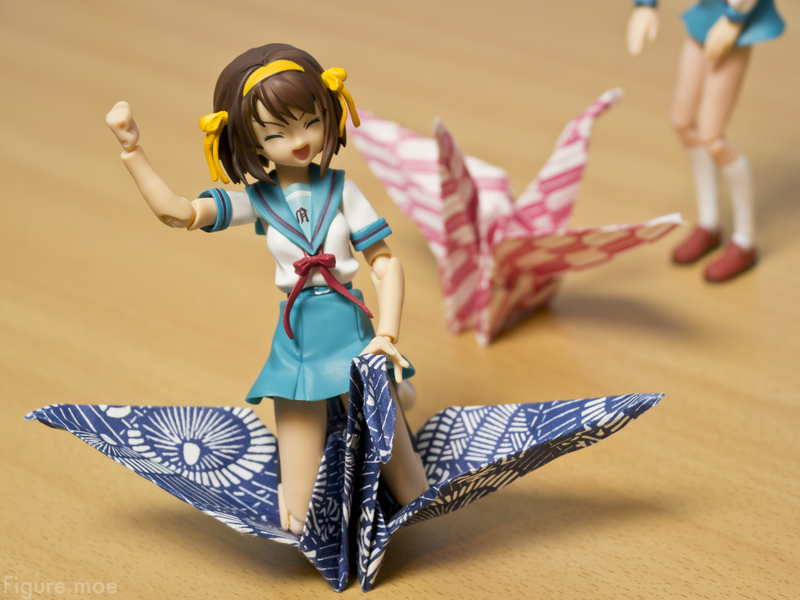 Haruhi Summer version was my first. It was so awesome I had to get two more! Now my collection is slowly growing and while it mostly consists of figma I am venturing more and more into scale figures as well. I am mostly collecting figures of characters which I like both their personality and look, but random good looking figures that I don’t know the character sometimes fall into my taste as well. I had seen some Macross when I was young but didn’t really know anything about anime until I got introduced to Chobits by my brother. After that I saw Love Hina and after that is when everything started to escalate. I don’t read manga because of two things: no time for it and anime has more to offer; animated visuals, editing, music, sound, voice acting and so on.